Safewards is a clinical model and intervention developed in the UK that seeks to reduce conflict and the use of seclusion and other restrictive interventions in acute inpatient psychiatric wards. Since 2014, researchers at the CPN have lead the evaluation of the Victorian government funded implementation of Safewards in the state of Victoria. The implementation of Safewards in Victoria is the most substantial and systematic in the world to date. Our current Safewards research team consists of CPN Director Assoc. Professor Bridget Hamilton, and Research Fellow and PhD candidate in the School of Population Health, Justine Fletcher. Assoc. Professors Steve Elsom and Natisha Sands were also involved the project's trial phase. Safewards' trial phase was rolled out in 18 wards across seven Victorian area mental health services. Post-trial evaluation found that Safewards was associated with reduced use of seclusion, when compared to a pre-Safewards baseline. Use of seclusion was also found to be lower in the trial wards than in comparable wards where the Safewards model had not been introduced. Evaluation also found that the model and the approach to its implementation had a high level of acceptance by both staff and consumers. You can view the initial evaluation report here. 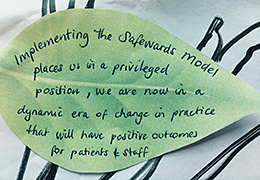 The Safewards model is currently being rolled out across all Victorian acute inpatient wards, with the support of the Victorian Government and the Victorian Hospital Insurers Agency. Completion is scheduled for 2019. 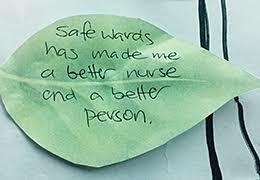 The CPN team are continuing to evaluate Safewards' impact at each new site, and its sustainability across services.